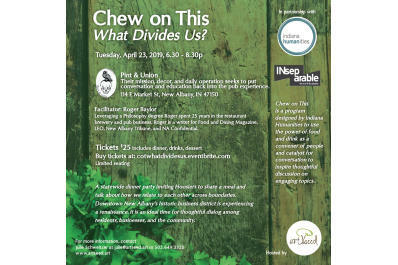 ArtSeed is pleased to announce that we have been selected to host one of six Chew on This events, a statewide dinner party inviting Hoosiers to share a meal and talk about how we relate to each other across boundaries. 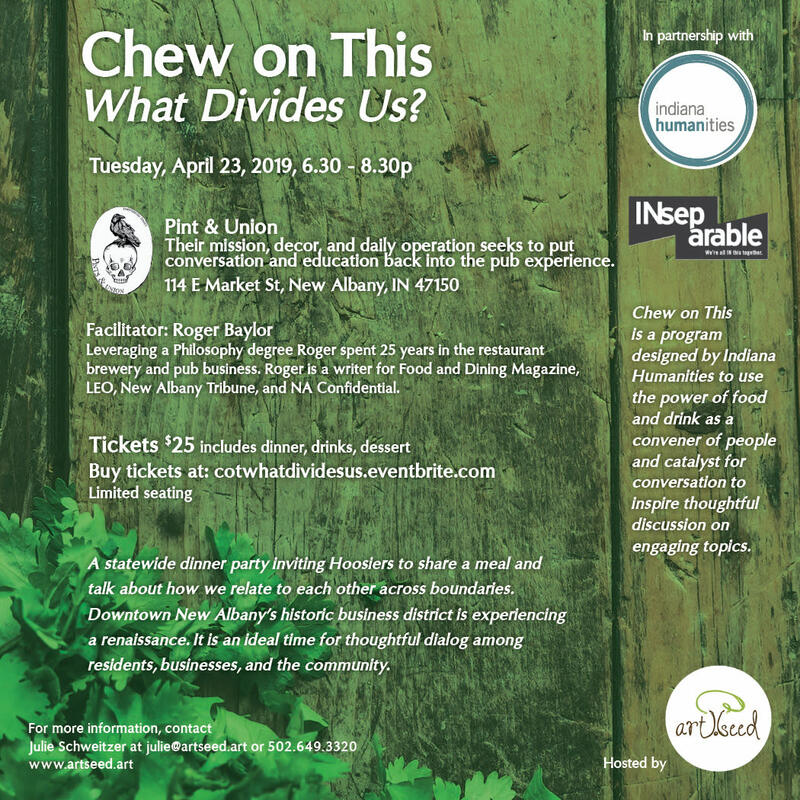 Chew on This is a program designed by Indiana Humanities to use the power of food and drink as a convener of people and catalyst for conversation to inspire thoughtful discussion on engaging topics. The topic for this program is What Divides Us? Downtown New Albany’s historic business district is experiencing a renaissance. It is an ideal time for thoughtful dialog among residents, businesses, and the community. This is a non-partisan event, political advocacy is non- allowable. Facilitator, Roger Baylor, leveraged a philosophy degree from IUS into an offbeat and successful service industry career. He learned that a bartender is the ultimate orchestra conductor, traffic cop, and facilitator in the community. Sometimes controversial, Roger has been instrumental in starting the conversation surrounding community issues. Roger is a writer for Food and Dining Magazine, LEO, New Albany Tribune, and NA Confidential.